I’ve been really flip flopping on what I want to do in the dining room. It’s a central point in our house and you walk through it from the living room to get to the kitchen and up the stairs. It really has to get along well with all of those rooms. Yesterday I showed you our finished board and batten. I love the black and white walls but I don’t want the room to feel cold or “color themed”. The pendant light is this one from World Market. Like I mentioned in a previous post, we already bought it. Snagged it on sale too! Some very popular bloggers you may know recently put three of these up in their hallway and I loved them so much I immediately bought one. We need to hang it to replace the world’s ugliest chandelier but we’ve been too busy on the weekends since we finally thawed out from Winter. I currently have drop cloth curtains hanging in here but I would like to paint gold stripes on them or stencil some other gold pattern on them. 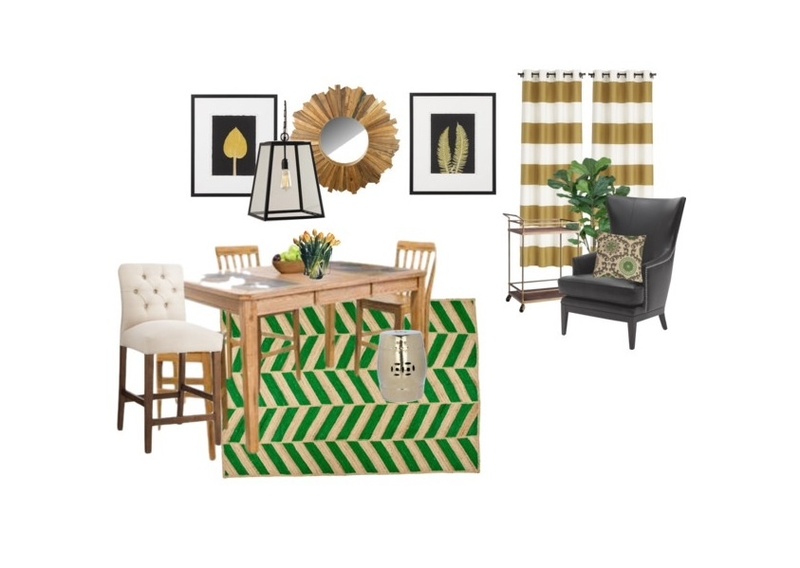 The bar cart, wood sunburst mirror and botanical art will all be DIY projects. Some of those are already in the works. That rug, right?! I LOOOOOVE it. It’s jute, so totally durable for under a dining table. Depending on our budget it might have to get DIY’d from a more affordable rug. I especially love this rug from RugsUSA. Just waiting on a sale, hopefully Memorial Day weekend. Fingers crossed!!! They are having a HUGE sale at Rugs USA!! Right Now.